To Cite: Safarpour H, Khorasani-Zavareh D. The Fourth Epidemiological Transition: The Need for Worldwide Focus on Reducing Morbidity and Mortality Rates of Disasters and Emergencies, Shiraz E-Med J. Online ahead of Print ; In Press(In Press):e86746. doi: 10.5812/semj.86746. The trend in human mortality has changed over the last decades and thus, the epidemiological transition has been introduced as an indicator of economic growth and public health (1). The epidemiological transition explains changes in the patterns of population age distribution, mortality, fertility, life expectancy, and factors leading to death. According to Omran’s theory, mortality is a major factor in population dynamics (2) and accordingly, three epidemiological transitions have occurred so far. The first epidemiological transition happened around 10,000 years ago when a dramatic change occurred in human lifestyle (1). Once agriculture became the norm, the pattern of diseases changed significantly. The changes in basic food production that occurred following the spread of agriculture formed a basis for the change in the pattern of diseases and increased the prevalence of communicable diseases. Factors increasing the risk of infectious diseases in this era included a rapid rise in the population numbers and density, settlement instead of decampment, further domestication and utilization of animals, extensive ecological disorder, and increased socioeconomic inequalities (3). The close contact with domesticated animals contributed to the development of many diseases that were common between humans and animals, and perhaps infectious diseases could be blamed for most deaths in this era. The prominent feature of the first epidemiological transition was the high prevalence of infectious and communicable diseases caused by the above-mentioned factors and subsequently the high mortality rate due to pathogenic factors. Additionally, war, famine, and drought were the main determinants of mortality and disease in this transition (2). The second epidemiological transition began in Europe and North America following the industrial revolution in the mid-19th century (1). The main aspect of this transition was the industrial development overtaking agricultural expansion. In the second epidemiological transition and following increased human longevity, chronic and degenerative diseases became more important than fatal pandemics of infectious diseases. In this transition, industrial development and change in the population age distribution reduced mortality due to infectious diseases, but further increased mortality due to chronic diseases (4). Industrialization, urbanization, new advances in medical science and technology, and improved quality of life were the main factors affecting the change in the pattern of diseases in the second transition, which happened first in high-income, industrial countries and ultimately spread into low to middle-income countries (5). Owing to the phenomenon of newly emerging infectious diseases, the third epidemiological transition has three main stage. The first is a large number of new diseases identified in the last few decades as the main cause of mortality. The second is the increasing incidence and prevalence of reemerging diseases and the third is resistance to antibiotics in many of these reemerging pathogens. Other important causes of change in the pattern of diseases and mortality include the growing expansion of global trade, migration, development of information networks, and the ecology of human diseases and environmental changes (1). For thousands of years, these three transitions have caused dramatic changes in the number of deaths due to diseases and their global patterns, and now the world community is confronting these changes in various ways. In recent decades, mortality caused by emergencies and disasters has been increasing such that the epidemiology of disasters has found a special place in the world in the last 20 years and mortality due to natural and man-made emergencies and disasters has attracted the attention of researchers and policy-makers; this has attracted greater attention from international organizations so that many global and international organizations and institutions including WHO, FEMA, World Bank, and UNISDR, as well as credible databases associated with emergencies and disasters such as EM-DAT, have addressed the importance of emergencies and disasters and their associated mortality. According to EM-DAT, 376 natural disasters occurred in 2015, which left behind 22,765 deaths and affected 110.3 million people. The economic loss caused by the 2015 disasters was estimated at $70.3 billion (6). Generally, the frequency of disasters, mortality rates, and populations affected by disasters have dramatically increased in the last decade (7) (Figure 1). Mortality due to injuries is increasingly turning into a worldwide public health epidemic. In total, 16000 people die of various injuries in the world every day. Injuries account for 12% of the total burden of diseases in the world, and are the third leading cause of mortality in the general population (8). In 2013, there were 973 million injury-prone people who required some kind of medical care, and 4.8 million people lost their lives due to injuries. Among natural and man-made emergencies and disasters leading to various types of injuries, the most frequent ones were road traffic accidents, self-harm, falls, and violence against each other, in sequence (9). Given all the above, the pattern of diseases and mortality seems to be changing and the world can be said to be experiencing the fourth epidemiological transition. In this transition, mortality due to communicable diseases is reducing and, meanwhile, people’s longevity is increasing in middle-income and high-income countries. In the fourth transition, mortality is not mainly due to infectious diseases, but due to natural and man-made emergencies and disasters that can happen at any age, any time, and any place. Although the pattern of mortality due to natural and man-made disasters is different in different countries, it seems to have an ascending trend. The main reasons for this transition include high population density, change in lifestyle, automated lifestyle, urbanization, climate changes, and poor perception of the risk of emergencies and disasters. Thus, emergencies and disasters have led to dramatic changes in the number of injuries and mortality rates and the worldwide change in their pattern has made the world community focus on the importance of this issue. Hence, paying attention to this issue can contribute to the prevention and reduction of injuries and mortality due to emergencies and disasters through proper planning and management of resources and application of strategies to reduce the risk of disasters by, for instance, improving disaster risk understanding, increasing disaster preparedness through public participation, and attracting the coordination and participation of various organizations in dealing with different emergencies and disasters at local, national, regional, and global levels according to the Sendai framework for disaster risk reduction. Conflict of Interests: We have no conflicts of interest to disclose. Funding/Support: No organization supported this research financially. 1. Barrett R, Kuzawa CW, McDade T, Armelagos GJ. Emerging and re-emerging infectious diseases: The third epidemiologic transition. Annu Rev Anthropol. 1998;27(1):247-71. doi: 10.1146/annurev.anthro.27.1.247. 2. Omran AR. The epidemiologic transition. A theory of the epidemiology of population change. Milbank Mem Fund Q. 1971;49(4):509-38. doi: 10.2307/3349375. [PubMed: 5155251]. 3. Armelagos GJ, Brown PJ, Turner B. Evolutionary, historical and political economic perspectives on health and disease. Soc Sci Med. 2005;61(4):755-65. doi: 10.1016/j.socscimed.2004.08.066. [PubMed: 15950089]. 4. McKeown RE. The epidemiologic transition: Changing patterns of mortality and population dynamics. Am J Lifestyle Med. 2009;3(1 Suppl):19S-26S. doi: 10.1177/1559827609335350. [PubMed: 20161566]. [PubMed Central: PMC2805833]. 5. Zuckerman MK. Modern environments and human health: Revisiting the second epidemiological transition. John Wiley & Sons; 2014. doi: 10.1002/9781118504338. 6. Guha-Sapir D, Vos F, Below R, Ponserre S. Annual disaster statistical review 2015: The numbers and trends. Centre for Research on the Epidemiology of Disasters (CRED); 2016. 7. The United Nations Office for Disaster Risk Reduction. Annual reported economic damages and time trend from disasters: 1980-2015. 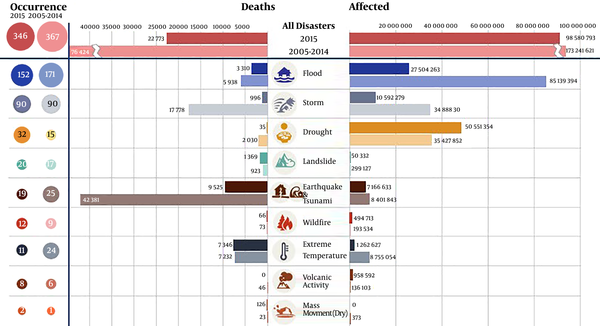 Human impact by disaster types (2015 versus average 2005-2014).The OFDA/CRED - International Disaster Database. The United Nations Office for Disaster Risk Reduction; 2015. Available from: www.emdat.be www.unisdr.org. 8. Peden M, McGee K, Sharma G. The injury chartbook: A graphical overview of the global burden of injuries. Geneva: World Health Organization; 2002. 9. Haagsma JA, Graetz N, Bolliger I, Naghavi M, Higashi H, Mullany EC, et al. The global burden of injury: Incidence, mortality, disability-adjusted life years and time trends from the Global Burden of Disease study 2013. Inj Prev. 2016;22(1):3-18. doi: 10.1136/injuryprev-2015-041616. [PubMed: 26635210]. [PubMed Central: PMC4752630].